Hello dear readers, it's less than two (2) weeks before Takladtamig Seis, the outreach climb at Mt. 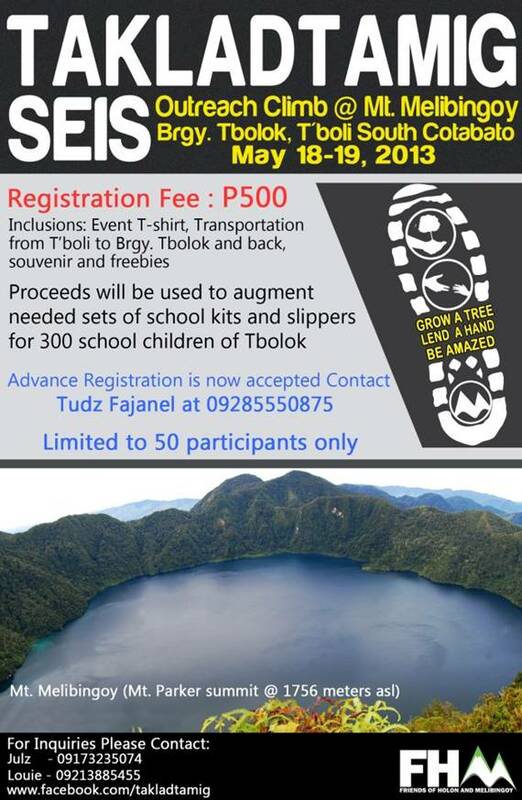 Melibingoy I am joining this coming May 18-19, 2013. Takladtamig is an outreach climb organized by a group of independent and solo mountaineers from South Cotabato called Friends of Holon and Melibingoy (FHM) (click to know more about the group and updates about the climb), it will be the sixth of its kind this May and the 1st year anniversary of the climb. I am excited to experience for the first time the climb to Mt. Melibingoy (1756 above sea level) and see in person the beauty of Lake Holon in the town of T'boli, South Cotabato which is said to be one of the cleanest lakes in country. Aside from that, I am also looking forward to take part in tree planting activity and gift-giving of school supplies and slippers to 300 school children in Brgy. T'bolok. Hope you can join too! Check out the event poster and the itinerary below. FHM still accepts donations in forms of school supplies and or slippers for the 300 school children of T'bolok, if your interested to donate please contact John Jay at 09285550875.